RLCX 8532 and UP 1981 on local at Tioga, Louisiana. May 15, 2006. UP 3829 and UP 9536 at the SSW yard at Pine Bluff, Arkansas. May 13, 2006. Coal cars and bridge. Little Rock, Arkansas. April 30, 2006. UP 5202 at Little Rock, Arkansas. April 30, 2006. UP 4601 northound out of Coffeyville, Kansas. April 24, 2006. UP 1865 with very short TOFC train southbound at Little Rock, Arkansas. April 18, 2006. UP 1857 and UP 1815 at Little Rock, Arkansas. April 18, 2006. CN 2682 southbound on the SSW at Brinkley, Arkansas. April 16, 2006. UP 5512 at Union Station. Little Rock, Arkansas. April 16, 2006. GECX 8497 leads northbound manifest. Little Rock, Arkansas. April 16, 2006. UPY 848 and UPY 859 working the UP yard. North Little Rock, Arkansas. April 10, 2006. UP 9284 and UP 1890 southbound in the afternoon at Union Station. Little Rock, Arkansas. April 9, 2006. UP 4859 with UP 1988 trailing slows to stop at Union Station. Little Rock, Arkansas. April 9, 2006. UP 1890 with northbound at Union Station. Little Rock, Arkansas. April 9, 2006. UP 4354 and UP 9861 at Little Rock, Arkansas. April 3, 2006. UP 9278 amongest the weeds at Union Station. Little Rock, Arkansas. April 3, 2006. UP 5092 and UP 4242 in the flowers again. Little Rock, Arkansas. April 3, 2006. Another flower shot this time with UP 1816. Little Rock, Arkansas. April 3, 2006. UP 2164 with Baring Cross bridge in background. Little Rock, Arkansas. April 3, 2006. Flowers and UP 3965 with COFC at Union Station. Little Rock, Arkansas. April 3, 2006. UP 202 leads northbound at Union Station. Little Rock, Arkansas. April 2, 2006. UP 5202 with northbound manifest. Little Rock, Arkansas. April 2, 2006. CSXT 7685 and UP 5186 on opposite ends of power move at Pine Bluff, Arkansas. April 1, 2006. NS 9623 on the UP at Little Rock, Arkansas. March 12, 2006. UP 3828 at Little Rock, Arkansas. March 12, 2006. UP 4449 at Little Rock, Arkansas. March 12, 2006. UP 4451 passes UP 601 working the SSW yard at Pine Bluff, Arkansas. March 31, 2006. UP 3330 and UP 2885 at Little Rock, Arkansas. February 27, 2006. UP 4904 and UP 3135 at Little Rock, Arkansas. February 27, 2006. 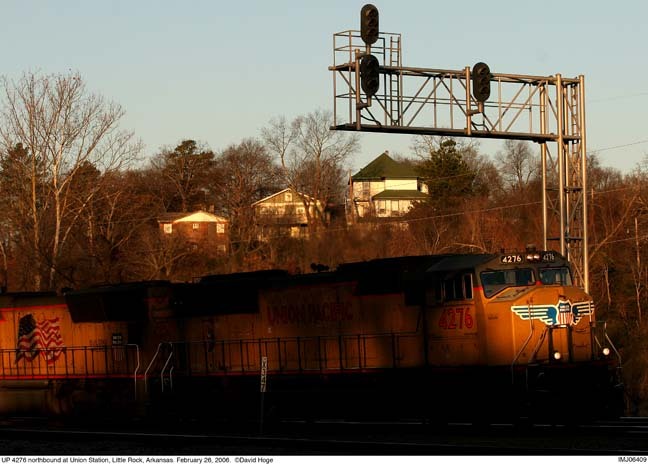 CSXT 7694 and GCFX 3076 at Little Rock, Arkansas. February 27, 2006. UP 1832 at Little Rock, Arkansas. February 27, 2006. UP 3838 at Little Rock, Arkansas. February 27, 2006. UP 1836 sits at Union Station waiting for intermodal train to pass at Little Rock, Arkansas. February 26, 2006. UP 4276 and UP 5094 at Little Rock, Arkansas. February 26, 2006. UP 1889 with engine move at Union Station, Little Rock, Arkansas. February 20, 2006. UP 2039 and UP 3167 with passenger cars during snow, Little Rock, Arkansas. February 20, 2006. UP 3395 at Little Rock, Arkansas. February 13, 2006. NS 5412 with BNSF 697. Little Rock, Arkansas. February 12, 2006. UP 3001 brings up rear of light engine movement. Little Rock, Arkansas. February 12, 2006. UP 8043 at Little Rock, Arkansas. February 12, 2006. UP 4653 and HLCX 9033 at Little Rock, Arkansas. February 12, 2006. UP 6862 and crew change at Union Station, Little Rock, Arkansas. February 12, 2006. Containers and boxcar at Little Rock, Arkansas. February 12, 2006. Waiting for clear signal, NS 9065 sits in the Amtrak siding at Union Station, Little Rock, Arkansas. February 7, 2006. UP 8755 at Little Rock, Arkansas. February 7, 2006. UP 4032 with northbound train at Union Station, Little Rock, Arkansas. February 5, 2006. UP 9515 at Union Station, Little Rock, Arkansas. February 5, 2006. UP 4715 at Little Rock, Arkansas. January 8, 2006. UP 3000, UPY 926 and UP 3001 at Little Rock, Arkansas. January 8, 2006. UPY 1375 under remote control at the SSW yard, Pine Bluff, Arkansas. January 21, 2006. UP 9550 and UP 9483 being hostled at the SSW yard, Pine Bluff, Arkansas. January 21, 2006. UP 9483 being hostled at the SSW yard, Pine Bluff, Arkansas. January 21, 2006. UP 9527 with northbound at Union Station at Little Rock, Arkansas. January 29, 2006. UP 3570 lead southbound through Union Station at Little Rock, Arkansas. January 29, 2006. NS 2661 leads a light engine movement at Union Station, Little Rock, Arkansas. January 31, 2006. UP 5484 and NS 3205 at Little Rock, Arkansas. January 31, 2006. UP 4008 crosses the Baring Cross bridge over the Arkansas River at Little Rock, Arkansas. November 24, 2005. UP 3932 and UP 4008 meet on the Baring Cross bridge over the Arkansas River at Little Rock, Arkansas. November 24, 2005. UP 5414 being hostled at service area at the UP yard, North Little, Arkansas. August 1, 2005. UPY 848 works hump job as LRWN 102 waits to leave the UP yard, North Little, Arkansas. August 1, 2005. UP 6719 eastbound at Rochelle, Illinois. June 21, 2005. UP MOW workers inspecting and welding on the BNSF/UP diamond at Rochelle, Illinois. June 20, 2005. UP 3823 eastbound at the BNSF/UP diamond, Rochelle, Illinois. June 20, 2005. UP 3050 eastbound at the BNSF/UP diamond at Rochelle, Illinois. June 20, 2005. UP 4867 at Little Rock, Arkansas. May 29, 2005. CEFX 7120 southbound at Union Station, Little Rock, Arkansas. May 29, 2005. UP 3854 at Little Rock, Arkansas. January 2, 2005. UP 4783 southbound at Union Station, Little Rock, Arkansas. December 24, 2004. UP 4489 northbound at Union Station, Little Rock, Arkansas. December 24, 2004. NS 9641 and NS 8830 westbound at Spring Lake Jct., Shreveport, Louisiana. November 27, 2004. CN 2598 and CN 5639 use the Amtrak siding at Union Station, Little Rock, Arkansas. October 3, 2004. EMD 6303 and CEFX 3183 at the SSW yard at Pine Bluff, Arkansas. September 19, 2004. NS 3355 with northbound train at Union Station at Little Rock, Arkansas. September 26, 2004. UP 9268 and NS 6755 southbound at Pine Bluff, Arkansas. September 19, 2004. UP 824 working the SSW gravity yard at Pine Bluff, Arkansas. September 26, 2004. UP 8107 leads northbound coal train at Union Station, Little Rock, Arkansas. September 19, 2004. UP 6560 southbound at East Little Rock, Arkansas. September 12, 2004. UP 5921 southbound with coal train at Union Station, Little Rock, Arkansas. September 26, 2004. UP 3685 with only two MP airplane parts cars at North Little Rock, Arkansas. September 12, 2004. UP 638 working the SSW gravity yard at Pine Bluff, Arkansas. September 26, 2004. UP 2280 southbound at East Little Rock, Arkansas. September 12, 2004. 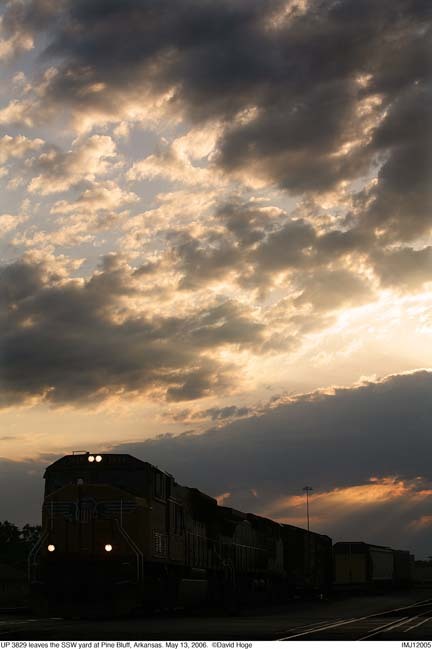 UP 677 and UP 302 hump cars at the SSW gravity yard at Pine Bluff, Arkansas. September 19, 2004. NS 8878 and NS 3528 with southbound train at Union Station at Little Rock, Arkansas. September 26, 2004. UP 7818 and UP 257 running light at the Locust Street tower at North Little Rock, Arkansas. April 11, 2004. UPY 848 at the UP yard, North Little Rock, Arkansas. April 11, 2004. UP 4122 northbound at North Little Rock, Arkansas. February 15, 2004. UP 7851 with the Nashville local comes off the Nashville branch at Hope, Arkansas. December 9, 2003. UP 8553 (SD90AC) northbound at Union Station, Little Rock, Arkansas. March 26, 2002. UP 7175 (C44AC) operating as DPU on coal train at Union Station, Little Rock, Arkansas. March 10, 2002. Dead locomotives lined up at UP's Jenks Shop, North Little Rock, Ark. February 6, 2002. UP 3232 southbound at North Little Rock, Arkansas. February 17, 2002. UP 7252 (C44AC) southbound with coal train at the Baring Cross bridge in North Little Rock, Arkansas. February 17, 2002. UP 4242 with northbound intermodal at Union Station, Little Rock, Ark. January 13, 2002. UP 9662 with SSW 9632 and SSW 9652 waiting for northbound at Union Station, Little Rock, Ark. January 13, 2002. UP 9662 passes northbound intermodal at the south end of the Baring Cross bridge, Little Rock, Ark. January 13, 2002. UP 9662 waits for northbound intermodal at Union Station, Little Rock, Ark. January 13, 2002. UP 3298 with southbound freight at Pine Bluff, Ark. December 15, 2001. UP 6552 southbound at Union Station, Little Rock, Arkansas after crossing the Baring Cross bridge over the Arkansas River. December 23, 2001. UP 7308 with 7 other locos with train at North Little Rock, Ark. Janaury 14, 2001. UP 5961 waits for the passing of MOW equipment at Union Station, Little Rock, Ark. Janaury 21, 2001. UP 236 passes UP 24565 caboose (on local) at Pine Bluff, Ark. January 20, 2001. UP 6936 (DD40) northbound with inspection train at Union Station, Little Rock, Ark. June 28, 2000. UP 2491 & UP 4734 lead westbound freight under I-40 through Levy, Ark. April 26, 2000. UP 8123 with a KCS coal train southbound at "Blue Cut" in Oklahoma. Feb. 7, 1999. UP 2149 heads southbound through Union Station, Little Rock, AR. Feb. 8, 1999. UP 6810 crosses Palarm Creek, west of Maumelle, Arkansas with loaded coal train. November 17, 1998. UP 5050 passes another train sitting in siding at Cart, La. October 17, 1998. UP 9700 leads a TOFC/COFC northbound through Gurdon, Ark. October 17, 1998. UP 6859 leads southbound TXUX coal train at Gurdon, AR September 27, 1998. UP 8218 at Guernsey, Arkansas with a Texas Utilities coal train August 16, 1998. UP 9109 at Union Station, Little Rock, AR. October 12, 1997. Olympic Torch Relay at Memphis May 26, 1996. UP 6195 heads into yard after passing under Main Street viaduct in North Little Rock, Ark. during snow storm. January 22, 1995. Checking and heating switches between Main Street viaduct and Interstate 30 in North Little Rock, Ark. during snow storm. January 22, 1995.